The Thundering Saints recently donated $8,000 to Hospice of the Red River Valley, generated from proceeds of the Seventh Annual Debbie Gabel Memorial Cancer Ride and Raffle, which was held in Valley City on July 25. The donation will be used to provide compassionate end-of-life care to those in Valley City and surrounding communities. 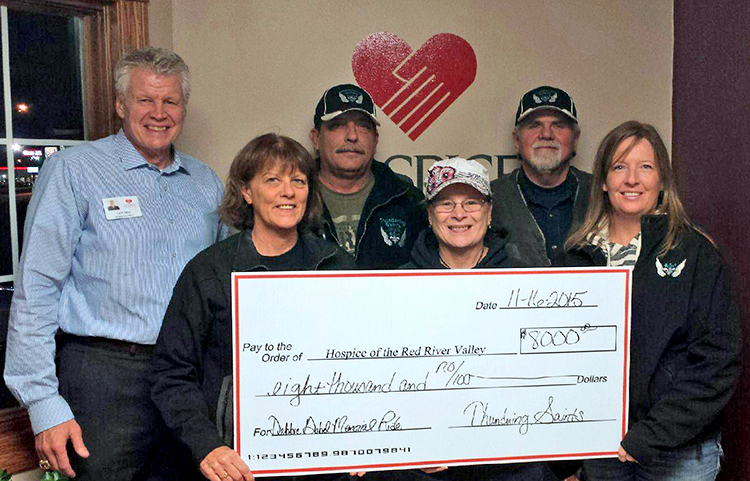 The Thundering Saints recently donated $8,000 to Hospice of the Red River Valley. Pictured: (back row) Curt Seter from Hospice of the Red River Valley, Larry Erickson, Rocky Gabel, (front row) Sue Peterson, Edie Johnson and Leah Fadness. This year’s ride attracted around 100 registered motorcycles. After the ride, they enjoyed dinner at Boomer’s, a live auction, a street dance featuring Blackwater and a raffle. The Debbie Gabel Memorial Cancer Ride and Raffle is held each year on the fourth Saturday in July to raise funds. Next year’s event will be July 23, 2016. Thundering Saints, Inc., is the non-profit organization that organizes the Debbie Gabel Memorial Cancer Ride and Raffle to raise money to help individuals fighting the battle with cancer. If you or someone you know has cancer, or if you’d like more information, please visit www.thunderingsaints.com, or call 701-490-0306 or 701-490-1446 to share your story.